It’s a great day job, that some would kill for, but take a contract on someone else, the wine has made me bulletproof. The Sta. Rita Hills is best known for Pinot Noir and Chardonnay but there are over 20 wine grape varieties planted and produced in our AVA. We invite you to join us at palate for this Sta. Rita Hills AVA focused tasting, meet with our producers, taste the wines and learn more about our distinctive growing region. Of the wines listed above I made a special note, though not enough room for full tasting notes (unless the area is otherwise noted, majority are from the Santa Rita Hills) of: Caragasacchi 07 and 08 Pinot Noirs (And winemaker Peter Caragasacchi’s wicked sense of humor paired very well. ), D’Alfonso-Curran 06 Rancho Las Hermanas and Rancho La Vina, Badge 09 “Blue Steel” Chardonnay Sierra Madre, Di Bruno 09 Pinot Grigio Sanford and Benedict, Demetria Estate 07 Pinot Noir, Dragonette Cellars 09 Pinot Noir, Fiddlehead Cellars 07 Pinot Noir Cuvée “Seven Twenty Eight” Fiddlestix Vineyard, Pali Wine 08 Pinot Noir Fiddlestix Vineyard, Seagrape 07 Pinot Noir Huber Vineyard and Sweeney Canyon 2000 Chardonnay and 08 Pinot Noir. Three from Longoria: 08 Pinot Noir “Lovely Rita”, 07 Pinot Noir, Fe Ciega Vineyard, and 07 Tempranillo Santa Ynez Valley. Another three from Prodigal Wines: 09 Pinot Gris Sierra Madre Santa Maria Valley, 08 Pinot Noir Fiddlestix and 07 Pinot Noir Appellation Cuvée. Okay, so is it too late for a nap now? 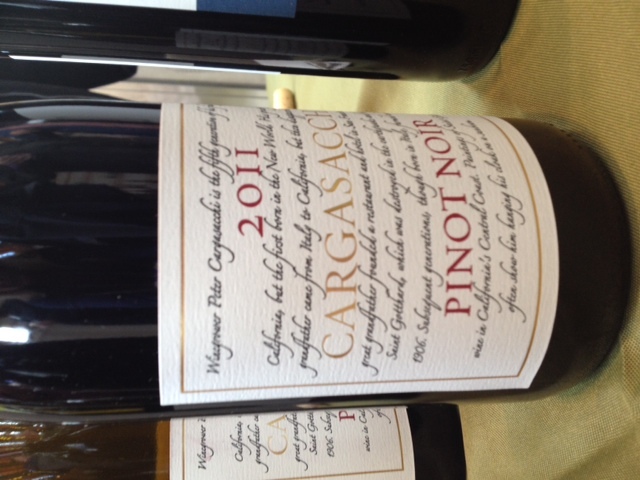 Last Sunday I attended the 1st Annual Pinot Days Southern California at the Barker Hanger in Santa Monica airport. Forcing myself out of my comfort zone I went over the hill for a tasting from over 85 producers. 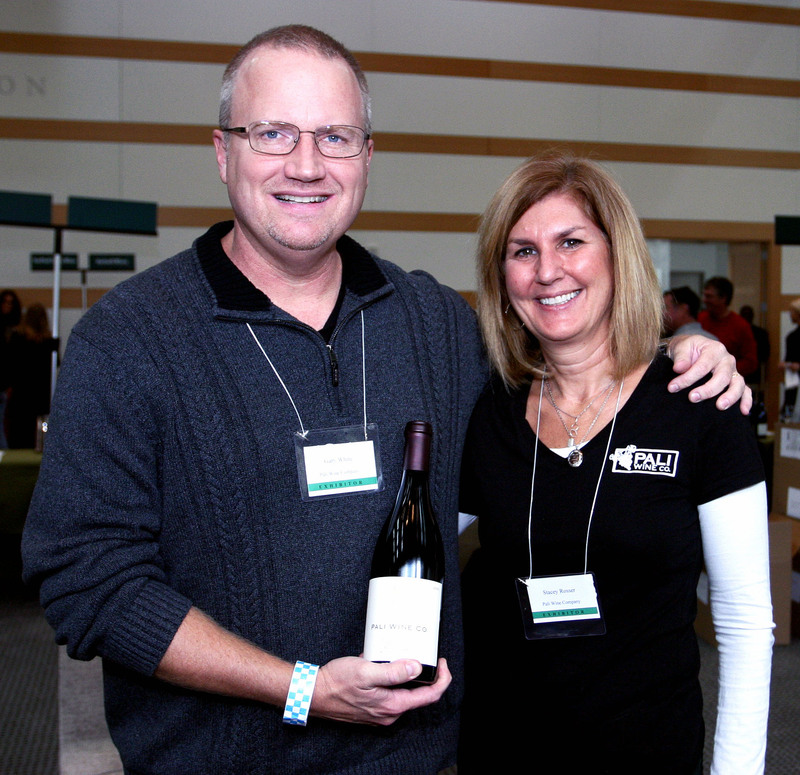 Organizers Steve and Lisa Rigisch had one goal: To educate people about Pinot Noir. 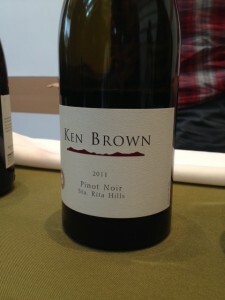 Pinot Noirs are on the opposite end of the spice spectrum from Zinfandel and Syrah. Considered too light by some, they can still employ a full range of fruit and tannins (spice). The ones that made an exceptional play at Pinot Days had higher alcohol percentages, leaning away from the former average of 12% and closer to 14 or even 15%. 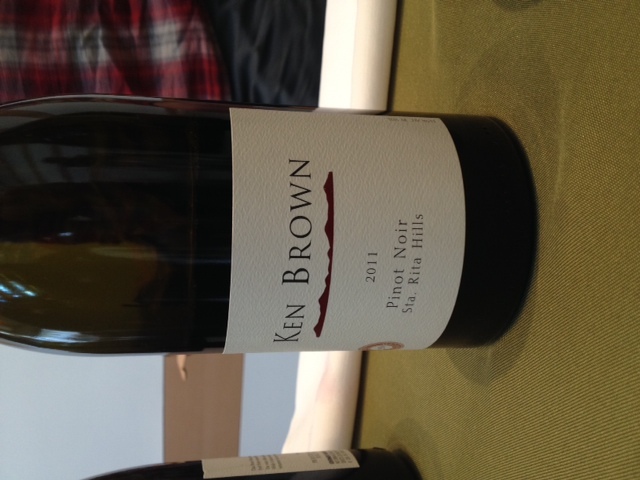 Those high numbers, usually reserved for those high – octane Zins, made this Pinot Noir tasting a standout. Hirsch Winery, Morgan Winery, Evening Land Vineyards, Gainey Vineyard, Gary Farrell Vineyards & Winery, Ascentia Wine Estates, Keller Estate, Ken Brown Wines, Three Sticks Wines, MacMurray Ranch, Clos Pepe Estate, Melville Winery, Domaine Chandon, Zotovich Family Vineyards and Flying Goat Cellars. Wes Hagen, Greg Brewer, Ken Brown, Ana Keller, Gary Farrell, Matt Adler, Dan Morgan Lee, Jasmine Hirsch, Edie De Avila, Denise Lowe, John Dickey, Dr. Joel Fisher, Chris and Dana Chernault, Tony and Laura Garcia, Victor Herstein, Alex Mendoza, Julie Brosterman, Xochtl Maiman, Lisa Rigisich, DiMaggio Washington, Kazia Schulhof, George and Jennifer Skorka, Jeff Levine, Mary Bradway, Katja Eastland, Don Rose, Peter Zotovich, Joel Burt, Bob Jones and Susie Majesky. 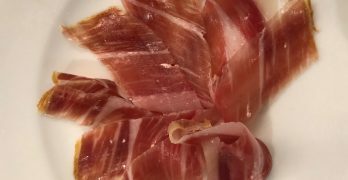 Like any large wine tasting, it’s not about the food unless billed as a wine pairing. We were thrilled to find the California Cheese & Butter Association selections well above standard “cheese plate” fare. At press time I’m trying to attain a list of the cheese served. I can only recall Black River Gorgonzola, white cheddar, San Joaquin Gold and Jarlsberg Swiss. Not all fared on my palate with my Pinot, but heck, that’s what the bread was for. 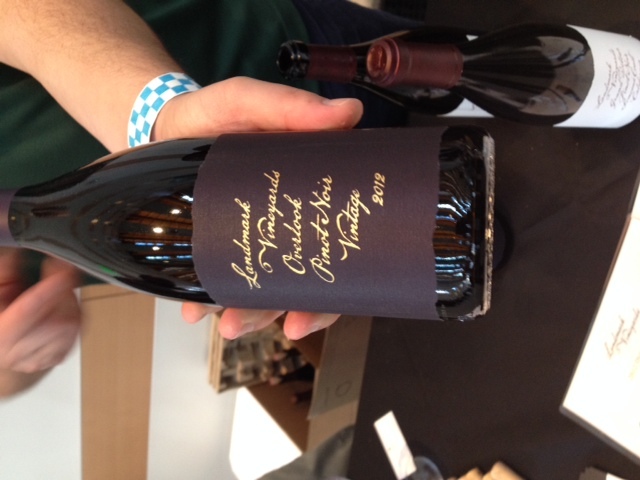 We have partnered with the Pinot Days to offer you a special discount of 33%, enter promo code EVESF14 when purchasing! 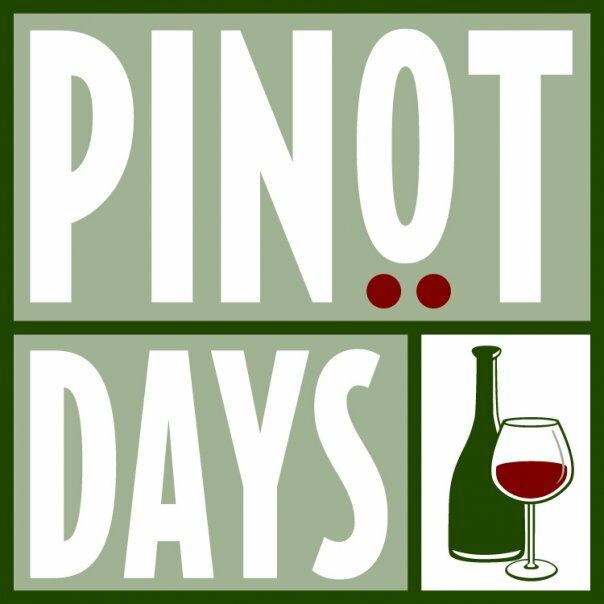 Click HERE to visit the Pinot Days website and order tickets or go directly to the Order Form by clicking HERE. We hope to see you there! 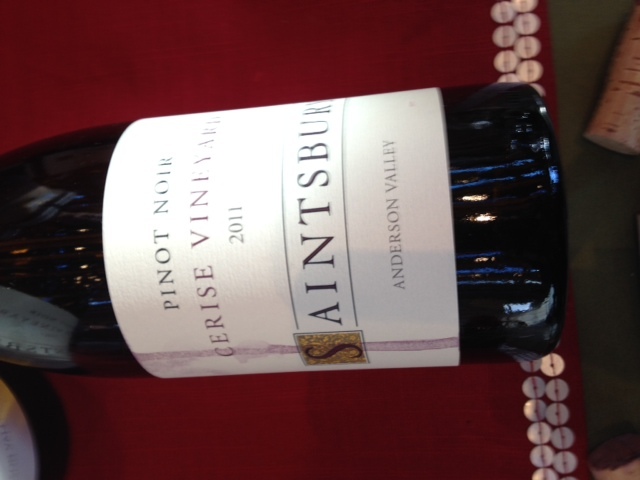 Saturday’s Grand Tasting will showcase over 80 phenomenal producers of pinot noir. Consumers will be able to sample hundreds of pinots from every important pinot noir region, from the Russian River Valley to the Santa Rita Hills, Oregon to the Anderson Valley to the Sonoma Coast. Come to taste these highly acclaimed wines, meet the gifted and charming winemakers who create them, and experience the passion and romance that the pinot noir industry continues to embody. Discover and celebrate pinot noir in its many diverse styles, ranging from modern to earthy to elegant. Explore new producers, find wines you love, and become a pinot devotee if you are not one already. We call it Serious Fun. Come see for yourself. Well, it’s the time of the year where wine tasting events pop up all over California, covering all kinds of grape varietals. Some are wide spread, but others are more focused, like Rhone Rangers (French Rhone varietals), ZAP for the Zinfandel lovers and then a number of events for the fans of Pinot Noir (Pinot in the City, Pinot Days). All of which are typically attended by huge crowds. I attend some of these, but my favorite is for a lesser known grape with smaller crowds. 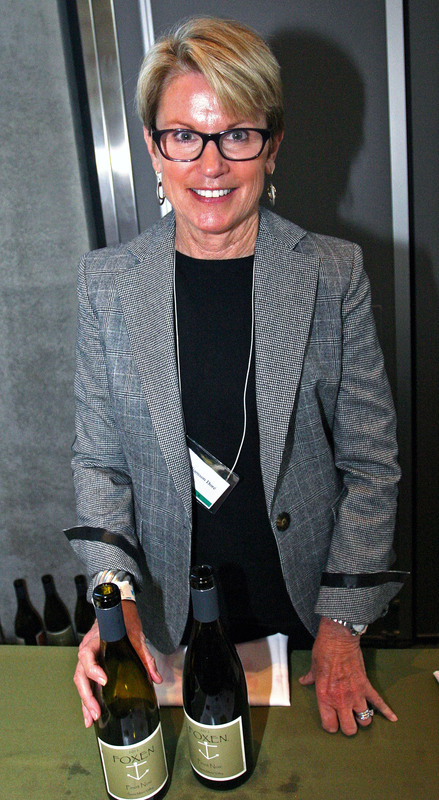 I attend an event that has maybe 500 people at most and brings together 40 to 50, and sometimes more producers of the Big Dog, better known to some of us wine geeks as Petite Sirah. Curious??? Are you a fan of the Big Dog or would like to be? Please read on and see if you may want to join us next year at “Dark and Delicious 2015”. 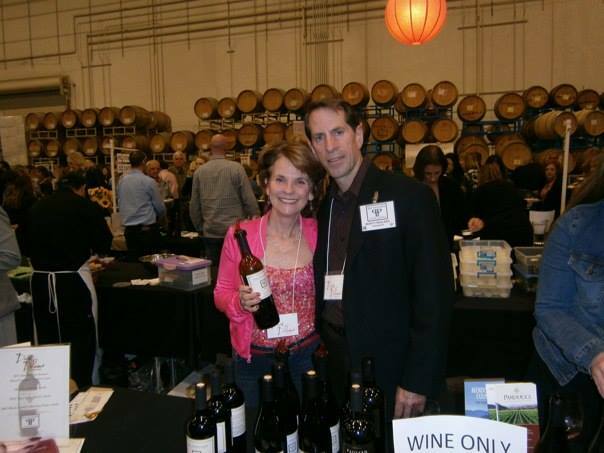 On the evening of February 21st, my girlfriend Lacy and I attended the 8th Annual “Dark and Delicious” event that celebrates the diverse stylings of Petite Sirah from all over California. This is the third year in a row I have been in attendance, enjoying the perfect combination of great wine, deliciously paired food and people with purple stained teeth. Housed under one roof in the barrel room of the Rockwall Winery Facility in Alameda, California, is an amazing event featuring Petite Sirah as the star attraction of the evening. The cast of wineries pouring this evening was stellar with more than 45 participants turning our teeth deep purple. 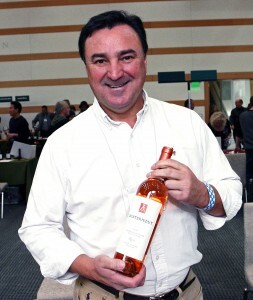 You have the old guard Petite producers in Concannon, Fieldstone, Foppiano, Parducci and Trentadue, but then some of the newer faces on the block are well represented too such as Denier-Handal, Occasio, Miro Cellars, Mounts Family and Tres Sabores. I’ll bet you are reading this and thinking, “Damn this is an evening of big, full bodied, tannic and potentially high alcohol wines, how can anyone taste much and not get overwhelmed”? Fortunately, the organizers are ahead of the game here, as the food line-up stood up to the wine producers with some great snacks to pair with the Big Dogs being poured. The food side of the event was well represented nicely by nearly 30 different vendors. Some of those wonderful folks matching their food with the Petites were Bert’s Desserts, Bonehead’s Texas BBQ, Chunk Pig, Fiscalini Cheese, Il Posta Trattoria, Montibella Sausage, Venga Paella, “What the Cake?” and Z Cioccolato. If you would like to see all of the wine and food producers check out the PS I Love you website at psiloveyou.org. I’ve mentioned that there was great wine and food at “Dark and Delicious 2014”, as happens every year, but let’s talk about the people. 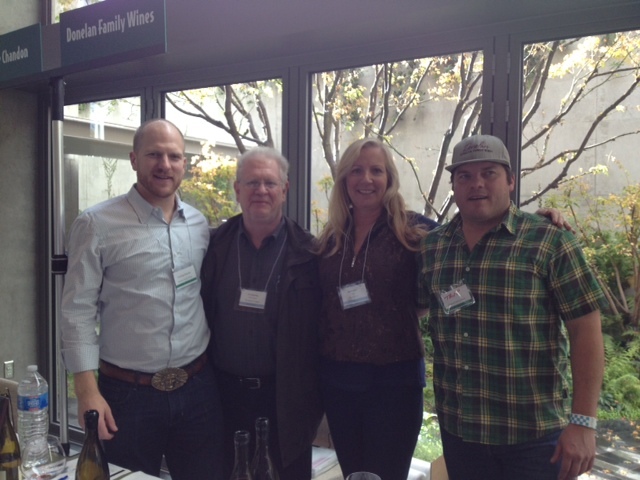 Some of the “people” representing the various wineries can be well known or come from families that are. 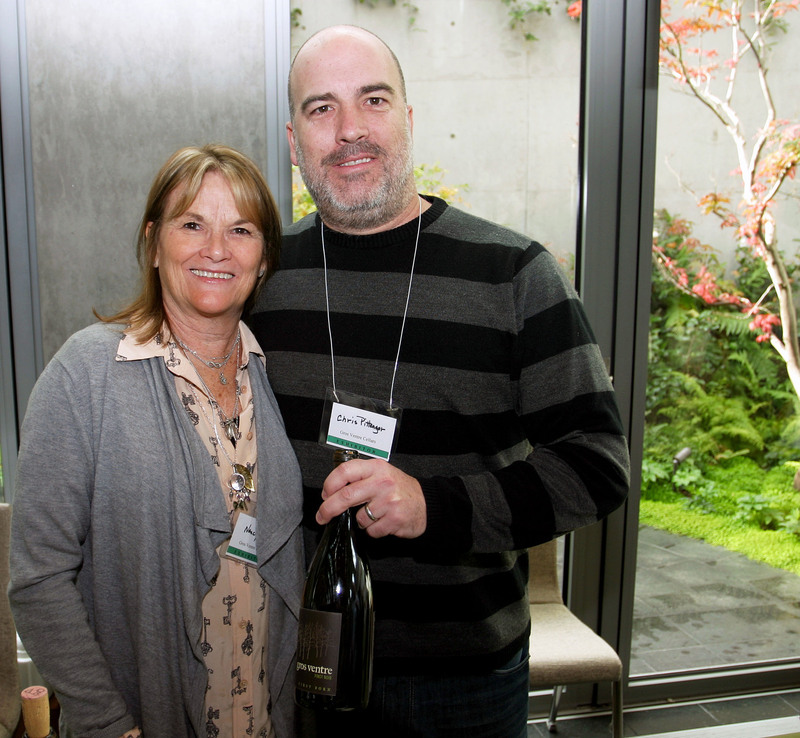 The host winery for the event, Rockwall Wine Company, was well represented by the Winemaker and President, Shauna Rosenblum, and her father Kent Rosenblum (former owner of Rosenblum winery). They were having fun greeting participants, pouring wine and telling stories. Shauna even led a great VIP tour of the Rockwall facility (one that I was able to tag along on). Including introducing us to a concoction made of Blanc de Blanc sparkling wine and Petite Sirah, surprisingly delicious and refreshing. Shauna and Kent were the hosts, but there were many more primary players of various wineries. There was a blast from the past pouring at the event as well, as Montgomery Paulsen poured his family’s Pat Paulsen Winery Petite Sirah (yes, his father was that Pat Paulsen, from numerous comical campaigns for president). 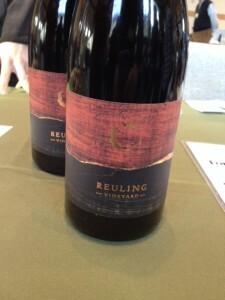 Monty, a character in his own right, was pouring the label that he now is the winemaker and owner for. 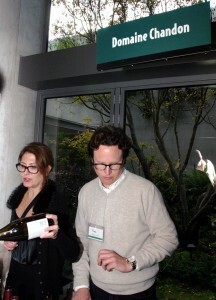 Additionally, there were a number of other owners or winemakers (Some being both). Like Miro Tcholokav, the owner and winemaker of Miro Cellars (also winemaker at Trentadue), Rich and David Mounts from Mounts Family Vineyards plus John and Judy Monnich of Silkwood Wines. Each of these folks, like so many other too numerous to name, were very accessible to talk about their wine, vineyards, history and so much more. This added informational and educational opportunities for the evening along with the enjoyment of so many huge, lush Petites. Overall, the evening was a success for the team from psiloveyou.org. 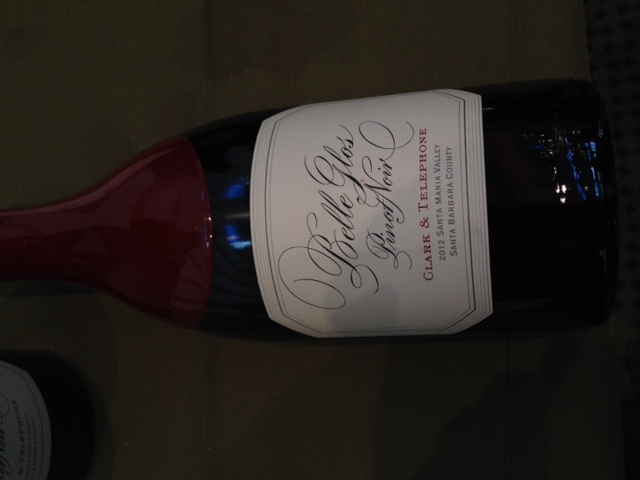 Along with the tasting and food, a silent auction took place during the 3 hour Petite Sirah celebration. 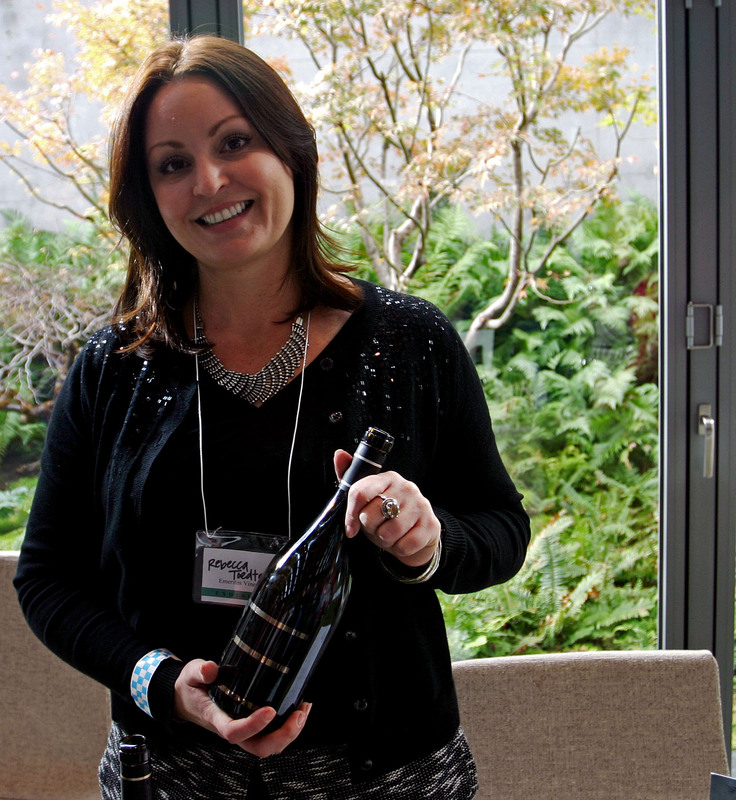 There were amazing wines and auction packages available, I’ll bet you are wondering how amazing! Well, I came home with two of the available lots, one a mixed case of Petites (a diverse kennel of Big Dogs), the second a vertical of wines from Denier-Handal Vineyards that when it was delivered to me, one of the owners invited us to a taste his wines on the front porch of his Dry Creek Valley home in Northern Sonoma County. Yes, I will be visiting him!!! So……….if you love the Big Dog, or if I caught your curiosity in the telling of this Dark and Delicious tale, join us next February and stain your teeth with the rest of us. I know it has been a while since you all heard from me, but life has been busy in the last year. 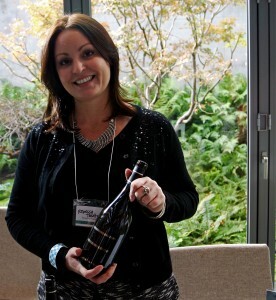 I have been given the title of Wine Educator and Assistant Tasting Room Manager for Martinelli Winery. Throw in judging for the San Francisco Chronicle Wine Competition and a few other industry related opportunities, you can see life is busy. I promise though, to make time to get more writing done in the future, hopefully hooking up for some tasting with Eve Bushman and Michael Perlis for a team tasting if we can schedule it. Before I bid you adieu, I do want share that there are some good events coming up in the SF Bay Area and Wine Country in the upcoming months. We have the Dry Creek Valley Passport Weekend (April 26-27), A Taste of Alexander Valley (May 17-18), Rhone Rangers (April 5-6), Passport to Pinot in the Russian River Valley May (24-25). Each of these are excellent events and you can easily find more information by searching them on the Internet if you are interested. 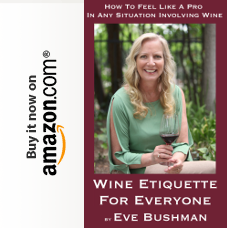 I would also encourage you to keep up with the upcoming events posted regularly here at Eve’s Wine 101. 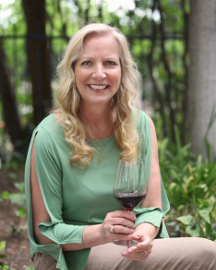 Just want to say thank you for following my adventures and encourage you to keep searching for the wines you love, whether they are from either your old favorites or from those new unknown creators of delicious wines. Remember, Life is Too Short to Drink Bad Wine!!!! Drink well and enjoy! Pinot Days 2013, as with Pinot Days of previous years, was a huge success. It never ceases to amaze me how many vintners, both small and large, attend this event to pour their creations for those who come to taste these wines. 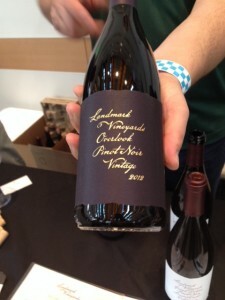 The wineries that are present at Pinot Days range from very small boutique wineries that produce only a few hundred cases to the well established wineries that produce thousands of cases. 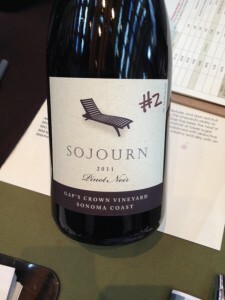 My mission for the 2013 Pinot Days festival was to focus on the lesser known, or smaller, wineries. 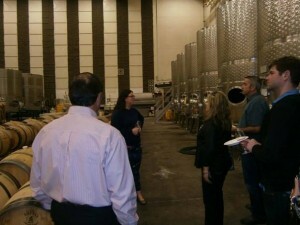 These smaller wineries are usually family run and produce limited allocations of their product. Many times, they only have a couple of wines at their booths. These families/wineries struggle to provide the best possible wine they can even in these difficult and challenging times. 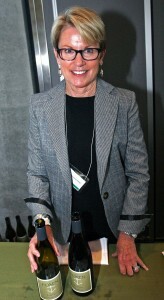 It is basically a battle to survive in a market dominated by large wineries that have deep pockets or partners. There is nothing wrong with this but I find a deeper passion with the smaller wineries. 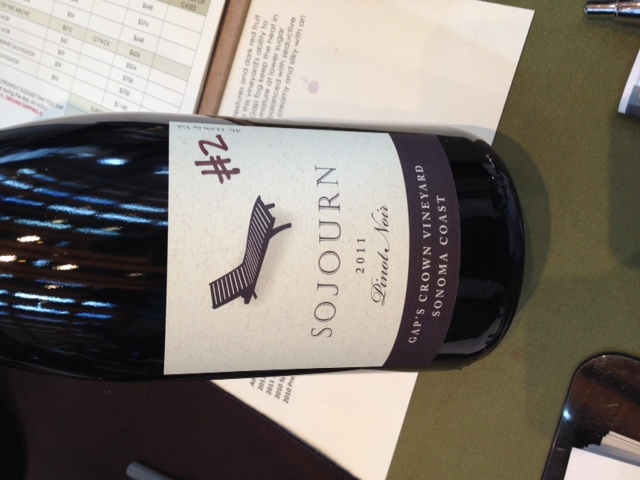 I was thrilled at the 2013 Pinot Days to meet the families and owners of many small wineries where the pride in their wines were noticed and, as with David and Goliath, were not afraid to step forward and showcase their products next to the well established Pinot Noir producers. That’s confidence for what you are doing and love of your product. The Pinot Noir grape is extremely difficult to grow and even tougher to produce. Add to this the fact that there are over a 1000 different clones of Pinot Noir grapes each having their own unique characteristics producing this wine comes with great challenges. Throw in varying terroirs and the sky is the limit for diversity in color, aroma and flavor. 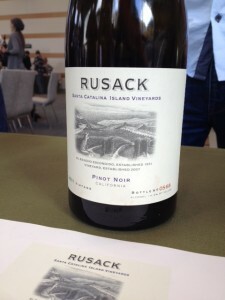 Attending an event like Pinot Days these influences and differences are quite evident. The diversity in flavors of Pinot Noir wines provide something for everyone. Some people gravitate toward the big bold Pinot Noirs that would make converts out of the Cabernet Sauvignon drinkers and yet others tend to select and enjoy the lighter more elegant Burgundian style. Flavors can range from dark cherries, bright cherries to cranberries, strawberry, etc. All I can say is that this is a fantastic varietal that provides an ecstasy in aromas and flavors. The great thing is that it offers something for everyone to enjoy. Pinot Noir is even a great stepping stone for someone wanting to move into reds but are not yet ready for the big, bold tannic Cabernet Sauvignons that most diehard red drinkers enjoy. 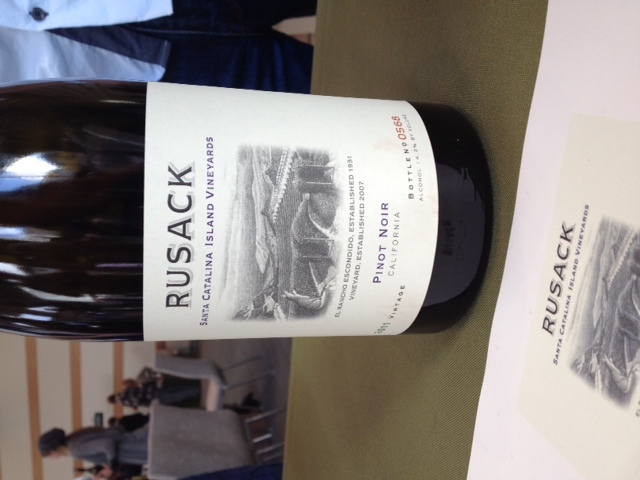 One of the thrills for me at Pinot Days was to go to a vintner that had produced Pinot Noir wine from different vineyards, regions or clones. This allows one to compare the terroir and clone differences as the vintner was the same for all of the wines. My feeling is that one could spend a life time learning about this unique varietal. Ancient Oak Cellars, August West, Blair Estate, Cargasacchi Wines, Domaine Chandon, Donelan Family Wines, Double Bond, Emeritus Vineyards, Fess Parker Winery & Vineyard, FOXEN, Fritz Winery, Gros Ventre Cellars, Hahn Estate, Inman Family Wines, J Vineyards & Winery, Ken Brown Wines, Kendric Vineyards, Kenneth Volk Vineyards, La Follette Wines, Loring Wine Company, MacMurray Ranch, MacPhail Family Wines, Martinelli Winery, Meiomi , Morgan Winery, New Zealand Winegrowers, Pali Wine Company, Reuling Vineyard, Romililly Wines, Rusack Vineyards, Saintsbury, Scherrer Winery, Siduri Wines, Sojourn Cellars, Sokol Blosser Winery, The Wine Check, Thomas Fogarty Winery, Thomas George Estates, Thorne Wine, Trombetta Family Wines, VinVillage.com, Waits-Mast Family Cellars, Wren Hop Vineyards and Z’IVO Wines. I would definitely put this event on the calendar for 2014. 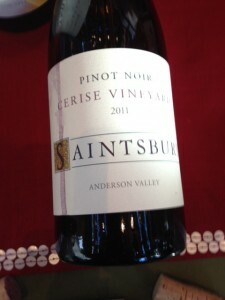 Not only for the pure enjoyment of trying so many fantastic Pinot Noirs but also to support the cause. The smaller vintners rely on word of mouth and this event helps consumers to discover them. With production less than a few hundred cases and all of the overhead expenses, these vintners need our support. 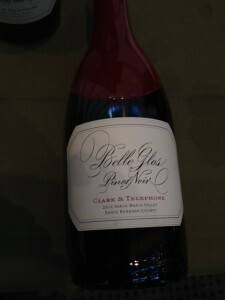 We also need to support the sponsors of Pinot days in this ever challenging business world. There are so many items that must be resolved to put on such a spectacular event. But one thing is for certain, they put on one of the best wine festivals around year after year. 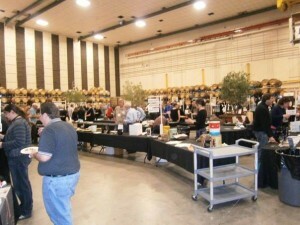 Thank you to all the vintners, trades and general public who attended as that is what makes this event such a success. 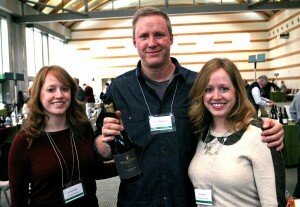 Wine connoisseurs are one big family, let’s support them and I will see you at the next Pinot Days. 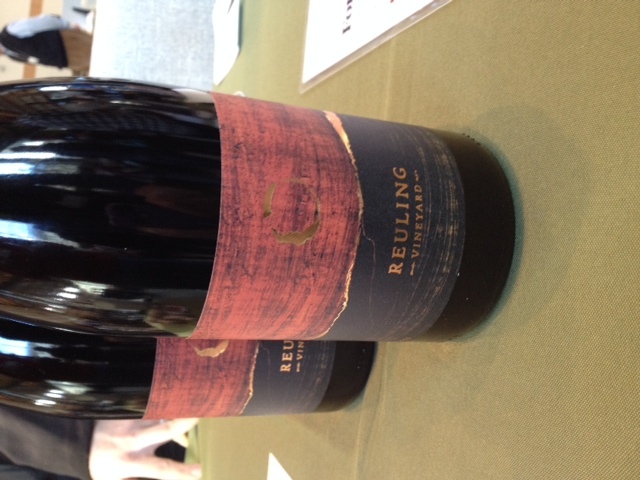 Pinot Days 2013: Mid-Size Event Benefits, Single Varital Tastings and My Faves of the Day! The difference between a large wine tasting event and a small one should be fairly obvious to a wine 101er. However, at the latest incarnation of Pinot Days, an event where only wines made from the Pinot Noir grape are offered, we enjoyed a mid-sized tasting that incorporated the best of both worlds, satisfying every type of attendee. 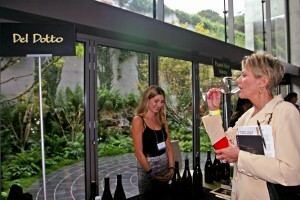 In a large venue guests can’t possibly visit every tasting table, so they select what they can, some racing from place to place; some taking their time. In this version I am the one on a race, and my husband is the meanderer. In a small event, maybe a wine pairing dinner, there is more time to enjoy the wines and maybe get to know a winemaker. This is a pleasant interlude, no racing involved, but only one winery, or a handful, may be available to taste. 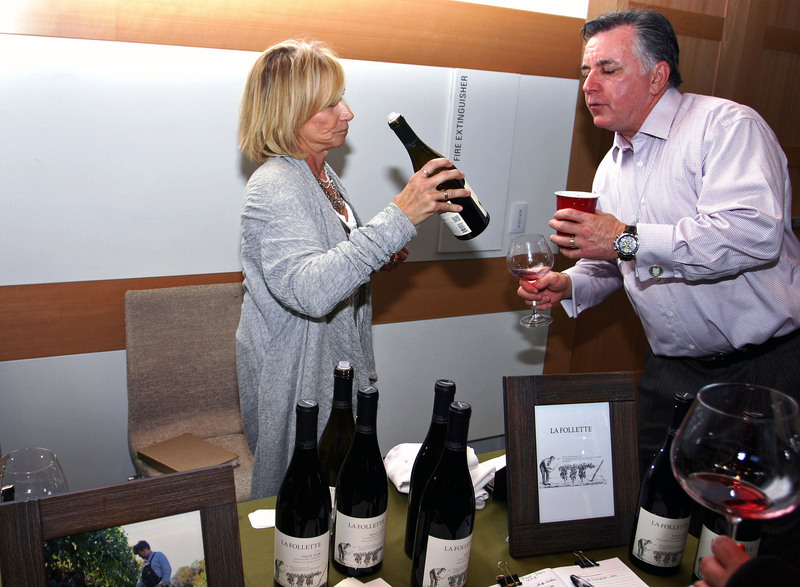 At the latest Pinot Days, taking up one of the rooms at the Skirball Cultural Center, we had the perfect mid-sized event. No need to rush the entire time, there was more than enough time to visit every table if that’s desired. In tasting one grape varietal at an event like this you get a chance to really compare terroir – a word that roughly means natural things that effects a wine’s outcome, such as soil, weather and vineyard location. The reason I explained a little more about Pinot Noir is to promote events like this, as well as Rhone Rangers, where we get to taste all Rhone varietals; the Cabernet Collective, where we try Cabs from Paso Robles; and all of the LearnAboutWine events such as Stars of Santa Barbara, Stars of Paso Robles and Stars of California, where we get to learn how different terroirs can effect taste. Now, onto the domestic Pinots that I thoroughly enjoyed meandering through – but didn’t take photos of: 2011 Ancient Oaks Cellars, 2011 Donelan Family Wines, 2011 Emiritus Vineyards, 2011 and 2012 Foxen, 2010 and 2011 Inman Family Wines, and a 2012 Loring Wine Company. My two standout favorites of the day were the 2011 Cargasacchi and the 2011 Foxen. 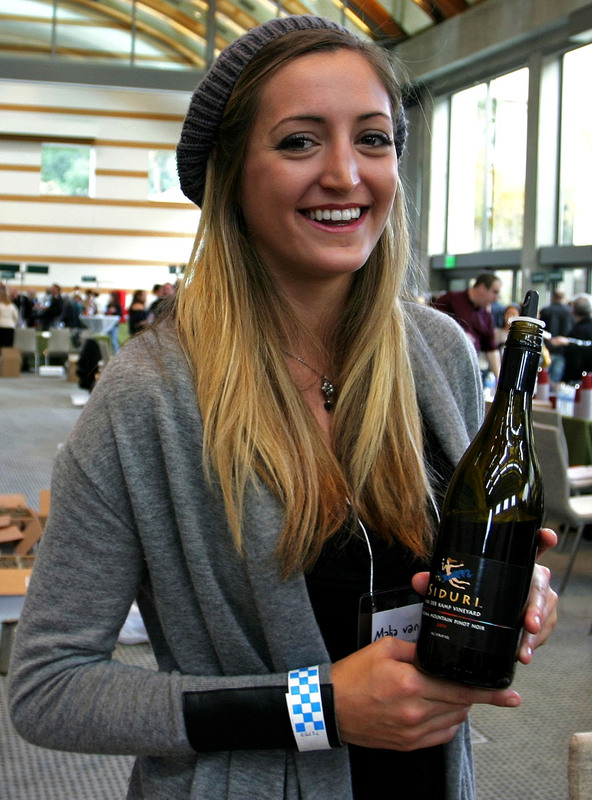 Pinot Days is the largest gathering of Pinot Noir producers in the world. It has to be; pinot noir is exceptionally stylistically diverse, and our aim is to give every pinot lover a place to “go deep” within the style you love. And, if you’re open to venturing outside of your comfort zone, you can learn about, and quite possibly love, other styles as well. To this end we gather hundreds of pinot noir winemakers to pour hundreds of pinots that range from the picture of elegance to forward and “wow.” You can’t try them all – don’t try – it’s not the point! The point is to follow your palate like a North Star, and experience this beautiful little grape in as many forms and styles as compel you. It is an endless pursuit of knowledge. So, ignore the critics; ask folks in the crowd, “Who have you tried? 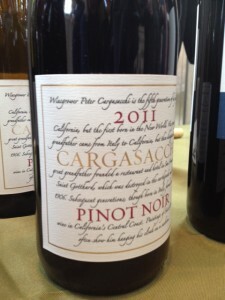 What do you like?” Pinot noir is way more than a grape variety – it’s an art form. It is an endlessly fascinating intellectual and aesthetic pursuit for people who want to savor the good things in life. So we invite the world to Pinot Days, because pinot noir can change the world, one pretty, little, thin-skinned grape at a time. 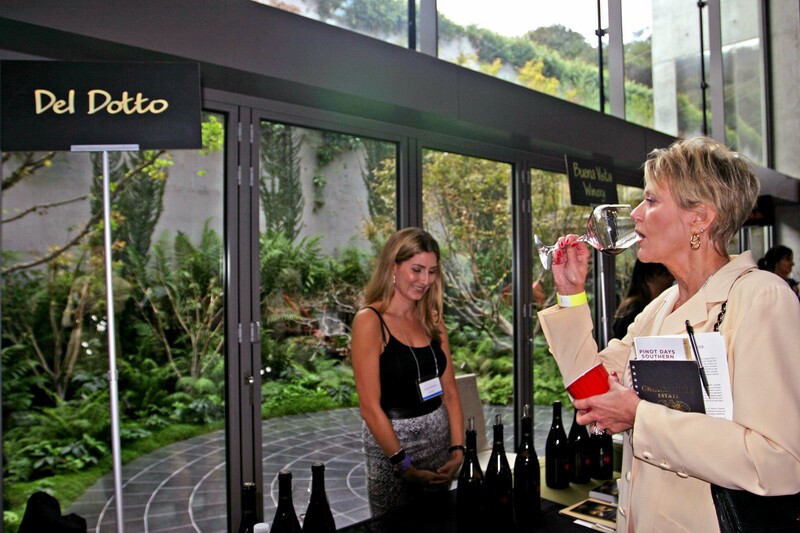 There are a few wine events that are on my “Can’t Miss List”, no matter what. 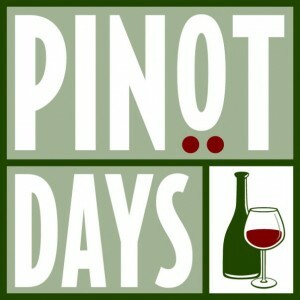 Pinot Days, held this year on December 7 at the Skirball Cultural Center, is one of these events. If this does not get your palate watering nothing will. When Tracy and I go to this event, we are forced to choose a few out of the multitude of wineries. The method to our madness is to try what we have not tasted before, in true Grape of the Night fashion. However, to be honest, we both have a weakness for a couple of specific wineries. Yes, that is my story and I am sticking to it. Bottom line: don’t miss this event. It is a chance of a lifetime to really get a good education on this diverse varietal.